Interference of target DNA by the crRNA guides. Exogenous DNA is processed into small elements by proteins encoded by CRISPR-Cas genes. These small elements are then inserted into the CRISPR locus near the leader sequence. RNAs from the CRISPR loci are constituitively expressed and processed by cas proteins to small RNAs composed of individual exogenously-derived sequence elements with flanking repeat sequence. The RNAs then guide other cas proteins to silence exogenous genetic elements at both the RNA and DNA level. Adaptation of the CRISPR is the recognition of alien DNA by dedicated cas proteins and/or host proteins, as well as the subsequent processing and integration into the chromosomal CRISPR locus. This stage has recently been demonstrated experimentally by Barrangou et al. by triggering virus resistance on the lactic acid bacterium Streptococcus thermophilus. The acquisition of new spacers occurred at the 5' end of the CRISPR as predicted. The fact that new spacers are integrated at the 5' side of the CRISPR suggests that they are a chronological record that reflects previous encounters with mobile genetic elements. Furthermore, spacers in both sense and anti-sense orientation turned out to be functional while only the leader strand is transcribed. This implies that the mechanism does not operate with a classical anti-sense mechanism at the level of mRNA, implying that DNA is the target. CRISPR expression is the transcription of the poly-spacer precursor crRNA which is followed by binding to a complex of Cas proteins and processing to mono-spacer crRNAs that serve as the guide sequences. It was discovered that pre-crRNA (longer transcripts) potentially covered the entire CRISPR and were step-wise processed to small crRNAs. Furthermore, only the leader strand of the CRISPR is transcribed and processed. Similar results has been obtained by expression studies of CRISPRS from both the bacterium Staphylococcus epidermidis and the archaea Archaeoglobus fulgidus and S. solfataricus. CRISPR interference involves the binding and/or degradation of the target nucleic acid (DNA). 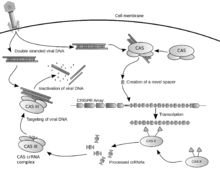 Studies of CRISPRs from S. thermophilus has provided experimental evidence that the CRISPR-Cas system has the ability to bring about specific viral resistance. Furthermore, experiments on the CRISPR-Cas system from S. epidermidis has showed that this bacterium lost its CRISPR-based immunity against a plasmid after a self-splicing intron was inserted into the proto-spacer of the plasmid. The intron is present at DNA level but spliced from mature RNA. This strongly suggests that DNA is the target of the CRISPR interference system. By implementing the CRISPR-Cas mechanism, bacteria are able to acquire immunity against certain phages and halt further transmission of targeted phages. Because of this, some researchers have suggested that the CRISPR-Cas system is a Lamarckian inheritance mechanism. Artificial immunization against phages by adding matching spacers of industrially important bacteria, such as in the milk and wine industries. Knockdown of endogenous genes by transformation with a plasmid which contains a CRISPR area with a spacer, which inhibits a target gene. Distinguish different bacterial strains by comparison of the spacer regions. This page was last edited on 8 January 2012, at 09:01.